Mother’s day this year is approaching soon. Application for Astro’s scholarship award 2017 is ongoing. Hari Ibu 2017 hampir menjelma. Dear Sponsors & Students, Once in a while we receive emails or messages telling us that the 8% fee Skolafund charges is unnecessary and the sponsor would rather sponsor the student directly into the student’s bank account. Kini ramai yang mula memperkatakan tentang ekonomi baru. How should millenials prepare for the new economy? Everyone is excited about the new economy. 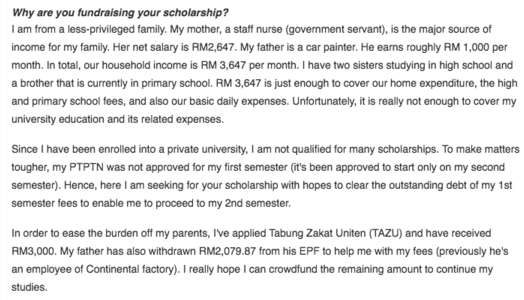 “Why are you fundraising your scholarship? ” – How to write this part well? For this section, the idea is for sponsors to better understand you and your background. We want to see if you have tried getting funding from the usual sources such as PTPTN, MARA, Zakat organisations and so on. We want to see a good reason for us to fund you. Why do you need help with funding from the sponsors on Skolafund? Talk about why you should be funded to complete your university education. Your dreams and how your education can help you achieve your dreams.